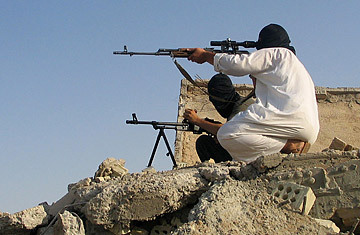 Masked Iraqi insurgents keep position at a lookout in the flashpoint town of Fallujah. The split between Sunni and Shi'ite Muslims is one of the most important schisms in modern religion  yet in the West, at least, it's one of the least understood. The centuries-old strife sporadically erupts into new bloodshed throughout the Middle East  today, particularly, in war-torn Iraq, where the power vacuum left by the fall of Saddam Hussein has reopened old wounds. As British-born journalist Lesley Hazleton argues, these wounds have been left to fester by a lack of adequate planning or understanding of the issue's complexities on the part of American policymakers. Her new book, After the Prophet, recounts the epic story of the split between Islam's two main factions and its present role in the Middle East. TIME talked to Hazleton about the history and misunderstandings of this dispute and what, if anything, can be done to extinguish it once and for all. What's the Shi'ite-Sunni split really about? It's about who should lead Islam, and it began at the moment of Muhammad's death. As the founder of Islam, he was the undisputed leader. And if he had had a son, the split might never have happened  a son would automatically have inherited his father's authority. But he died without sons and without leaving a clear will. His closest male relative was his cousin and son-in-law, the philosopher-warrior Ali, whose followers  the Shiat Ali [followers of Ali], or Shi'ite for short  say that he was the only one with the spiritual authority to succeed Muhammad. The Sunnis believed that the caliphate should go to whoever would be best equipped politically to maintain the burgeoning Muslim empire, backing Muhammad's father-in-law Abu Bakr. In the end, Abu Bakr was named the first caliph. Though Ali eventually assumed the caliphate 25 years later, he was assassinated, power fell to the founder of the first Sunni dynasty, and the Shi'ites felt a terrible, lasting sense of dispossession. In a nutshell, the difference between the two is that the Sunnis tend to respect how power actually works rather than the way it should work in an ideal world. In a sense, the Shi'ite ideology is more idealistic, while the Sunni one more pragmatic. What would you say was the absolute breaking point? That came just 48 years after Muhammad's death, when Ali's son Hussein  Muhammad's grandson  challenged what he saw as the corrupt and tyrannical Sunni leadership and was killed at Karbala. The massacre of Muhammad's grandson and most of his family sent shock waves throughout the Muslim empire. At that point, what is history for Sunnis became sacred for Shi'ites. You say Hussein is known among Shi'ites as the Prince of Martyrs. How did his death shape the significance Muslims place on martyrdom? In much the same way as the martyrdom of Christ did for the early Christians. Shi'ites see it as the ultimate self-sacrifice. They say he knew his own death was the only way to wake the conscience of Muslims and call attention to tyranny and corruption  that he knowingly sacrificed himself for the sake of all Muslims and all oppressed people. Where does modern suicide bombing play into this theme? Aside from the use of the word martyrdom, very little. Today's suicide bombings are mainly orchestrated not by Shi'ites but by a small minority of radical Sunni fundamentalists, most notoriously al-Qaeda. Such attacks are weapons of war, and the use of the word martyr for suicide bombers is seen as a perversion of Islam by most spiritual leaders, both Sunni and Shi'ite. How did Iraq become the "cradle of Shi'ism," as you put it? The key events of Shi'ite identity all took place in Iraq. Ali was assassinated near Najaf, where the city rose around his shrine. Hussein died at Karbala, which then became the twin holy city to Najaf. So if there is one place the rift between Shi'ites and Sunnis has always been most volatile, it is Iraq. You say there is no way to understand today's grim headlines from Iraq without grasping the depth and power of the conflict between the two main branches of Islam. What part of the conflict do you think is most important and least understood by Americans? We tend to say impatiently, "Why can't they all just get along?" But in Iraq  throughout the Middle East, in fact  what happened centuries ago is as alive and fresh as though it had happened just yesterday. The story of Hussein has been transformed into Shi'ite liberation theology. What was a story of tragic loss and dispossession is now one of liberation from oppression. That makes it all the more important for us to grasp today, when the U.S. is cast in the role of the occupier  and thus the oppressor. What would U.S. policymakers have learned from your book had it been available in 2003? What critical mistake might they have avoided? I cannot believe that anyone aware of this story would ever have sent U.S. troops anywhere within a hundred miles of holy cities like Karbala and Najaf. They would have realized that any attempt to intervene between Shi'ites and Sunnis could only be, at best, self-defeating. Do you think that Shi'ites and Sunnis will be able to coexist again peacefully in Iraq? What do you see as the future of this conflict? Coexistence, certainly. In the near future? I fear not. But it's worth remembering that for long periods of time, Shi'ites and Sunnis have indeed lived side by side in relative peace. The conflict is always there, but there are times when it subsides, like embers. When we invaded Iraq in 2003, we fanned those embers into flame. It will take time for them to die down again. There are no quick fixes here. Until we understand the depth and power of this conflict, any action we take, even with all the best intentions in the world, is likely only to make things worse. Read "In Iraqi Politics, the Sunni-Shi'ite Divide Recedes." Read "Behind the Sunni-Shi'ite Divide."